Spot is white all over with black ears, a black patch on the left side of his face and a black spot on his back. He has black button eyes and a black button nose. Just stand back and watch him go! Spot was introduced 8th January 1994. Spot’s first release oddly didn’t have a spot on his back but was later re-introduced with the missing spot. 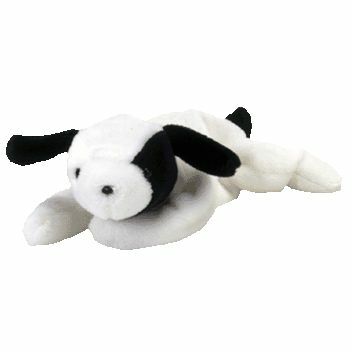 The version without the spot is one of the rarest Beanie Babies around and is incredibly sought after. Spot was retired on 1st October 1997.